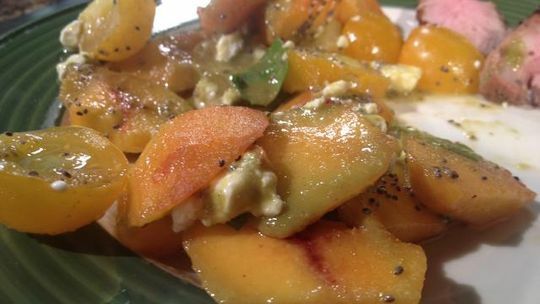 Combine the tomatoes and peaches in a bowl and lightly drizzle with the dressing. Top with the feta cheese and chia seeds. Lightly garnish with fresh basil. Serve chilled. Combine the basil, onion, olive oil, vinegar, honey and Dijon in a blender until the dressing emulsifies and the basil is pureed. Add a dash of salt and pepper to taste.